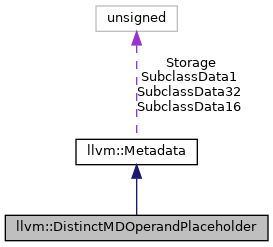 This is a lightweight placeholder for an operand of a distinct node. It's purpose is to help track forward references when creating a distinct node. This allows distinct nodes involved in a cycle to be constructed before their operands without requiring a heavyweight temporary node with full-blown RAUW support. Each placeholder supports only a single MDNode user. Clients should pass an ID, retrieved via getID(), to indicate the "real" operand that this should be replaced with. While it would be possible to implement move operators, they would be fairly expensive. Leave them unimplemented to discourage their use (clients can use std::deque, std::list, BumpPtrAllocator, etc.). Definition at line 1280 of file Metadata.h. Definition at line 1286 of file Metadata.h. Definition at line 1295 of file Metadata.h. Definition at line 1300 of file Metadata.h. Replace the use of this with MD. Definition at line 1303 of file Metadata.h. References assert(), llvm::MetadataTracking::track(), and llvm::MetadataTracking::untrack(). Definition at line 1281 of file Metadata.h.